Prey capture by Dionaea muscipula A review of scientific literature with supplementary original research. Stephen E. Williams and Siegfried R. H. Hartmeyer (2017). Carnivorous Plant Newsletter Vol. 46/2: 44-61. Keywords: Dionaea muscipula, Venus flytrap, habitat, prey attraction syndrome, alluring glands, nectar secretion, red color, scent, UV-reflection, fluorescence, size selection, capture rate. f spiders, ants, and beetles. Flies are only oneto-eighteen percent of what it captures. In a greenhouse where flies, capable of entering the vents, composed most of the available prey, over 90% of the prey captured were flies. Dionaea cultivated in a garden captured a diverse array of animals, only about 37% of which were flies. Dionaea is a generalist, capturing a wide variety of prey species. Its capture mechanism does not appear to have a “syndrome” analogous to the Pollination Syndrome in flowers where a specific floral type is pollinated by a specific animal (i.e. Bee Flowers or Fly Flowers). The measured capture rates of Dionaea are low, about one capture/leaf/month in its native habitat. Similar but lower rates were measured in the greenhouse and garden. The single measurements in each habitat need to be repeated, but the low rates are consistent with the observation that wherever it is observed Dionaea has nearly all of its traps open. Both the low capture rates and the large number of open traps suggests that alluring agents drawing prey either do not exist or are ineffective. Despite reports of nectar secretion by Dionaea traps, our observations show that unstimulated traps are always dry unless wet by rain, condensation, or a sprinkler system. Secretion occurs only after prey capture. Alluring glands along the outer trap margin have been reported to be visited by small ants that work their mouthparts over the glands. We have photographed a fly exhibiting the same behavior. The exact nature of this behavior needs to be further investigated, but it does not appear that this attractant can act at a distance since flies are as likely to land on the outside of a trap as on the inside. Darwin proposed that the trap closure mechanism allows small prey to escape, preventing the expenditure of energy on captures likely to be of little benefit. Recent measurements of prey captures indicate that traps show little selectivity based on prey size and that while traps could, in theory, select larger prey, statistically they do not behave this way. Full text PDF / ganzer Text als PDF: click on cover / Cover anklicken. Bennett, K.T., and Ellison, A.M. 2009. Nectar, not colour, may lure insects to their death. Biology Letters 5(4): 469-472. Darwin, C. 1875. Insectivorous Plants. John Murray, London. 462p. Faegri, K., and van der Pijl, L. 1979. The Principles of Pollination Ecology. Pergamon, Oxford. 244p. Foot, G., Rice, S.P., and Millett, J. 2014. Red trap colour of the carnivorous plant Drosera rotundifolia does not serve a prey attraction or camouflage function. Biology Letters 10 20131024; DOI: 10.1098/rsbl.2013.1024. Hartmeyer, S.R.H., Bayerl, R., and Hartmeyer, I. 2013. Leuchtende Karnivoren: Die Lumineszenz der Schierlingsbecher. Das Taublatt 75: 33-44. Hutchens, J.J., and Luken, J.O. 2009. Prey capture success by established and introduced populations of the Venus Flytrap (Dionaea muscipula). Ecological Restoration 33(2): 171-177. Hutchens, J.J., and Luken, J.O. 2015. Prey capture in the Venus flytrap: collection or selection? Botany 87: 1007-1010. Joel, D.M., Juniper, B.E., and Dafni, A. 1985. Ultraviolet patterns in the traps of carnivorous plants. New Phytologist 101(4): 585-593. Jones, F.M. 1923. The most wonderful plant in the world. Natural History 23(6): 589-596. Jürgens, A., El-Sayed, A.M., and Suckling, D.M. 2009. Do carnivorous plants use volatiles for attracting prey insects? Functional Ecology 23: 875-887. Kreuzwieser, J., Scheerer, U., Kruse, J., Burzlaff, T., Honsel, A., Alfarraj, S., Georgiev, P., Schnitzler, J.P., Ghirardo, A., Kreuzer, I., Hedrich, R., and Rennenberg, H. 2014. 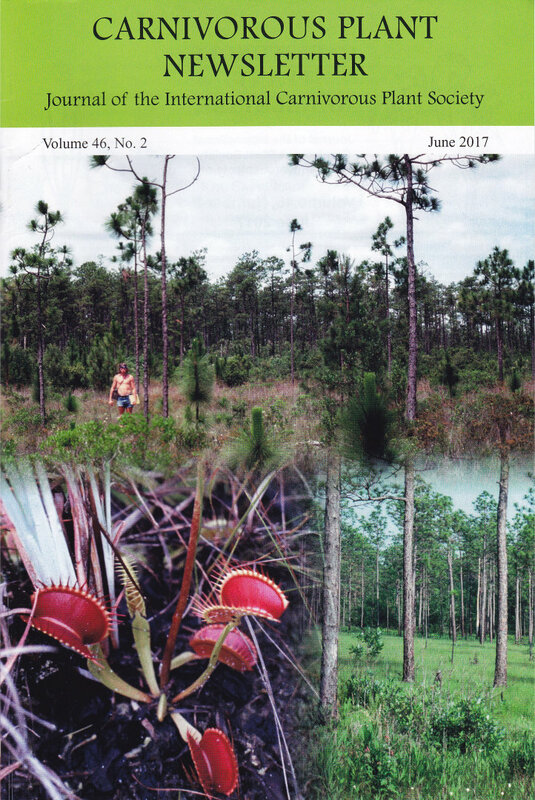 The Venus flytrap attracts Volume 46 June 2017 61 insects by the release of volatile organic compounds. Journal of Experimental Botany 65(2): 755-766. Kurup, R., Johnson, A.J., Sankar, S., Hussain, A.A., Kumar, C.S., and Sabulal, B. 2013. Fluorescent prey traps in carnivorous plants. Plant Biology 15(3): 611-615. Lichtner, F.T., and Williams, S.E. 1977. Prey capture and factors controlling trap narrowing in Dionaea (Droseraceae). American Journal of Botany 64(7): 881-886. Messier, P., Baas, V., Tafilowski, L., and Varga, L. 2005. Optical brightening agents in photographic paper. Journal of the American Institute for Conservation 44(1): 1-12. Nelson, E.C. 1990. Aphrodite’s Mousetrap: a biography of Venus’s flytrap, with facsimiles of an original pamphlet and the manuscripts of John Ellis, F.R.S. Boethius Press, Aberystwyth, Wales. 145p. Roberts, P.R., and Oosting, H.J. 1958. Responses of Venus fly trap (Dionaea muscipula) to factors involved in its endemism. Ecol. Monographs 28: 193-218. Schaefer, H.M., and Ruxton, G.D. 2008. Fatal attraction: carnivorous plants roll out the red carpet to lure insects. Biology Letters 4(2): 153-155. Williams, S.E. 1980. How Venus’ flytraps catch spiders and ants. Carnivorous Plant Newsletter 9(3): 65,75-78.